Photograph courtesy Kate Drabinski, 2013 June 16. In 2011, Baltimore Heritage started an initiative to highlight the historic places significant to Baltimore’s LGBTQ community through tour and education programs. Past project partners have included Baltimore Black Pride, the GLCCB and Baltimore Queerstories. Special thanks to Phillip James Hayes-Lovett for establishing our LGBTQ Heritage Initiative during his 2011-2012 internship with Baltimore Heritage. Recording the Rainbow Revolution: As gay bars in Baltimore shut their doors, activists work to document LGBTQ history, July 21, 2015. Kate Drabinksi, Baltimore City Paper. The Evolution of Baltimore’s Pride Festival: As Pride prepares to celebrate its 40th year, we look back at the local LGBT celebration, June 30, 2015. Lauren Cohen, Baltimore Magazine. New partnership houses gay center’s archives at University of Baltimore, March 17, 2014. Kevin Rector, Baltimore Sun. Effort to preserve Baltimore’s gay history is underway, September 20, 2013. Kevin Rector, Baltimore Sun. Baltimore LGBT history recalled, June 26, 2013. Steven Charing, Washington Blade. Many know Mount Vernon as Baltimore’s “gayborhood,” the home of the Pride Parade and Block Party and some of the city’s most popular gay and lesbian bars and businesses. 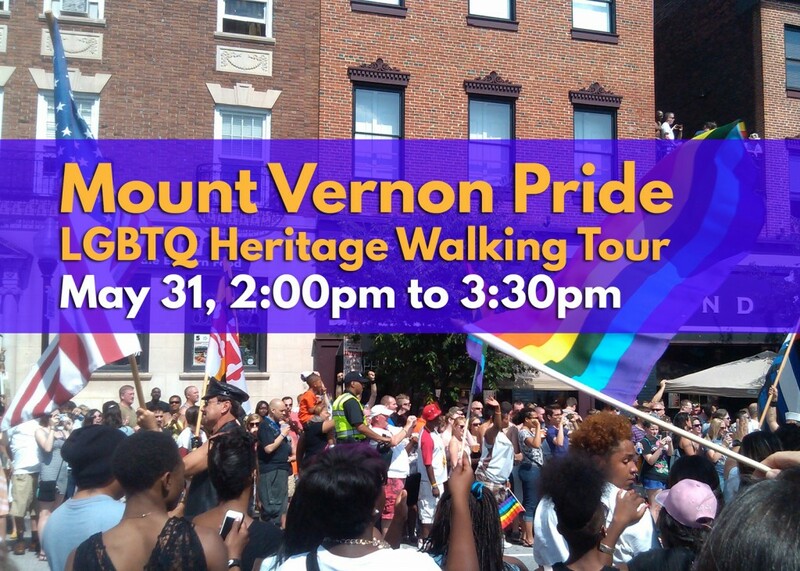 But bars and parades are only a part of the importantLGBT history that can be found in the neighborhood!Join Baltimore Heritage for a free two-hour walking tour through Mt. Vernon’s LGBT history and landmarks from Gertrude Stein’s Eager Street home to the locations where John Waters shot and screened some of his earliest films. As far back as the 1890s, LGBT Baltimoreans in Mt. Vernon have been leaders in their community, like the ardent feminists (with intertwined lives) who fought for women’s admission to the Johns Hopkins Medical School in 1893. From the more recent past, we’ll hear about the medical professionals and volunteers who led the city’s first responses to the AIDS epidemic and residents who founded Baltimore’s only African American LGBT-identified church. This tour is a unique opportunity to explore the places and events that have shaped the growth of Baltimore’s LGBT community and civil rights movement.Take a walk with volunteer sleuths and historians Louis Hughes, Richard Oloizia, Shirley Parry and Gary Sachau and learn about Mt. Vernon’s unique history as the city’s foremost LGBT-identified neighborhood. Although Charles Village is better known for its colorful “painted ladies,” the neighborhood was home to many of the activists and institutions at the heart of the city’s LGBT community in the 1970s and 1980s. Historian Richard Oloizia and activists Shirley Parry and Louis Hughes will take us on a walk past local landmarks from the original home of the Gay Community Center of Baltimore, now the GLCCB, to the St. Paul Street church that supported the growth of the Metropolitan Community Church, Baltimore’s oldest LGBT religious organization, and the radical feminist publishers, writers and activists that gave a voice to lesbian authors who might not otherwise have been read. Whether you lived this history or are learning it for the first time, this tour is a unique opportunity to explore the places that shaped the growth of Baltimore’s LGBT community and civil rights movement. Baltimore Heritage is celebrating the history of African-American Gay, Lesbian, Bisexual, and Transgender people in Baltimore in partnership with Baltimore Black Pride. Together we have organized a panel discussion on 30 years of African-American history in the city as experienced through pioneers and leaders in the GLBT community. Join us this Saturday afternoon, October 8 for a engaging panel discussion. This event is part of the annual Baltimore Black Pride celebration that also include an array of community vendors providing resource services. Light refreshments will be served.